Can’t complain about 2010. Got a new house, with room for the agility yard. And bonus, less then 10 minutes from work. Final agility yard accessories (contacts) are arriving next week. Trip had a great year, awesome girl that she is. Came back to agility competition 8.5 weeks after having puppies, and picked up right where she left off. Her Q rate is 75-80%, and she’s fast as hell too. She earned 20QQs this year–10 to finish MACH2, and 10 more towards MACH3. Can’t complain about that either. She also finished her ADCH, no small feat for a 13″ dog jumping 16″. There were some less stellar moments–she didn’t make the Finals at Nationals (is that sad when that’s a disappointment), but she did made the Challenger Round. I hope to get her back to the Finals in 2011. Trip definitely improved at World Team Tryouts from 2009 to 2010. Her times were close, her turns were great–she was about two mistakes from being a contender. Hopefully 2011 is our year. 2010 wasn’t great for all my guys. Mardi ended up struggling this year, and I finally decided it was time for her to retire. She did have her best Nationals, ran great there, and had a fun time. But everyday at a show, I never knew if she was going to be able to weave or not–everything else looked great, and she always WANTS to run. I did learn to just enjoy every run with her, no matter what happened, since I wasn’t sure how much longer it would last. She’s having some non-arthritis related health issues now, and I hope we can get those resolved early in 2011 and get her back to 100%. Shiner is still a happy house dog. He loves his new yard and chasing the ball, and is doing well. So, what’s in store for 2011? Well, for Trip, big goals, as always. 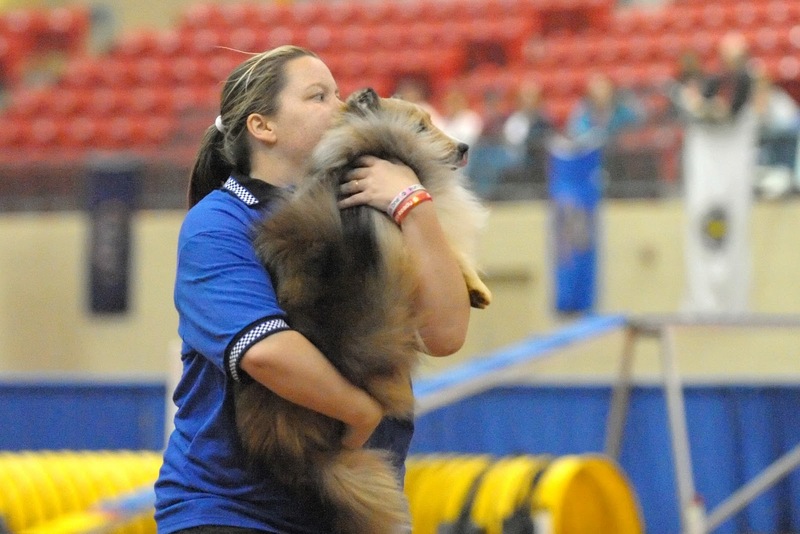 I hope to make the Finals at AKC Nationals, and am planning on attending USDAA Nationals as well. We will be going to World Team Tryouts again, and I’m hoping this is our year. I’m really trying to clean up my handling and work on a couple of things with Trip to give us the best chance of making it. I will be getting together a training schedule and trying to stick with it. Ticket will be starting her competition career, first with AKC, then with USDAA. I can’t wait to get her out there–she such a blast to run. I know what I expect her to do, but since I have no idea what issues we might have once we get in the ring, any goals for her will just have to wait. Hopefully she’ll blow through Novice and Open and into Excellent. I’ll continue to work on her handling, trying to stay consistent, and harness all the power while still getting tight lines on the course.